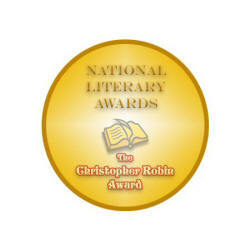 WINNER of the 2009 National Literary Foundation's Christopher Robin Award for Children's Literature! 2009 Next Generation Indie Book Award Finalist & 2009 BEST BOOKS Award Finalist! 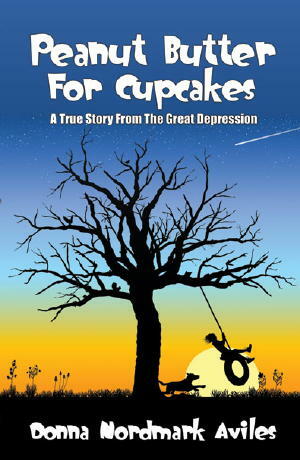 Peanut Butter For Cupcakes by Donna Nordmark Aviles is a great true story about a family living during the Great Depression. When something horribly tragic happens to this family, the six kids are suddenly forced into foster care. This book is sad, but has a very enjoyable and different style than most books, and the characters were really well developed. The author's storytelling style enabled me to really get to know the characters. Instead of just staying in the point of view of one character for the whole story like most books do, this one uses several points of view. First, it was from the children's mother's point of view, then their father's, and then it switched through each child randomly. I enjoyed this style very much because you got to know so much about all the characters. Also, you got to know more about the characters from the way the book is arranged. Each chapter tells a story, and by the end, I felt like I had seen pretty much every step of the character's lives. Then, even after learning all those things about the characters, there's a small story about each of the children at the end of the book that explained what happened to the characters in adulthood. I thought this was a great change from the usual style and arrangement in books, and wish they were like this more often. Peanut Butter For Cupcakes by Donna Nordmark Aviles is a great story. It has a different, yet nice style, and a well-arranged plot that really lets you get to know the characters. I would recommend this book to my friends, perhaps giving a warning about the sadness. I hope Donna Nordmark Aviles writes more books, and I can't wait to read the rest of the ones that are already published. Written in such a style that not only is engaging but also informative and educational, "PEANUT BUTTER FOR CUPCAKES" brings alive the life and times of one of the most difficult periods in U.S. History. However, unlike your standard history text, or those big biographical tomes that are typical of books covering the Depression, author Donna Aviles delivers a story written to capture the heart and soul of the reader. Having to overcome the unexpected death of their mother and the economic hardships of the Depression, Oliver's six children provide the story with enough mischief, adventure, and heart to keep the reader interested. Not only does the reader learn about this desperate time in history, including how the Civilian Conservation Corps and the Works Progress Adminsitration saved many a family, but also about personal character, responsibility, and integrity. "PEANUT BUTTER FOR CUPCAKES" is bound to be considered a classic in its genre. Rarely do you find in a book a story that can not only teach your children important history lessons, but also how families in the past survived some of the hardest of times. It is this final aspect that gives the book its unique component, for it provides young adults with a sense of respect for their ancestors - a level of respect that is very deserving but often not given. "PEANUT BUTTER FOR CUPCAKES" like Donna Aviles' two other books, should be considered essential reading. Although it is meant to be the third and final installment in Donna Nordmark Aviles's "Orphan Train" series, Peanut Butter for Cupcakes stands alone as a fine historical fiction novel depicting the real life experiences of a Pennsylvania family living through the Great Depression. Oliver Nordmark (the author's real life grandfather) grew up without parents of his own. Orphaned at a young age, he was shipped out west via the "orphan train" movement and given away to a Kansas couple as a cheap farm laborer. As depicted in the first two books of this series, Oliver passes through the hands of several families without ever completely being a part of one. As Peanut Butter for Cupcakes opens, Oliver is a grown man with a wife and six children living in the Pocono Mountain region of Pennsylvania. When Oliver loses his job and a tragic accident takes the life of his wife, he struggles to support his children and ultimately has to seek help from the same Child Services organization which once sent him out as a farm hand. PB for C focuses mainly on the life of Oliver's children as they try to stick together through various foster care arrangements, as well as Oliver's attempts to make a living and take his children back into his own care. The title refers to the youngest Nordmark's attempt to trade a peanut butter sandwich (which was his lunch everyday) for a sweet, scrumptious cupcake brought by another student to school. The effort fails, and yet Benny Nordmark doesn't give up hope that someday he might be able to turn his "peanut butter life" into a "cupcake." Benny and his brothers are lively and rambunctious. Although readers will find some of their foster parents harsh and unkind, it is also obvious that the Nordmark brood were a handful. Schoolyard pranks, horseplay with rifles, and accidentally setting a field on fire are just some of the hijinks these rascals get up to. Interspersed with the boys' pranks and the rough life in foster care are heartwarming stories of the Nordmark family during time with their father, such as when Oliver drives the family to visit the World's Fair, even though they cannot afford to do anything but look. This book is highly recommended as a study of life in the Great Depression through historical fiction. Donna Aviles never set out to be an author. When asked about her previous career, she laughs and answers, "Raising kids." The 50-year-old Hockessin resident just released her third book, a true story of her grandfather Oliver Nordmark and his ordeals and adventures of raising six children during the Great Depression. Oliver was also the subject of her first two books. Aviles' first book, Fly, Little Bird, Fly!, chronicles Oliver's journey with his younger brother Edward from the New York State Orphanage to Kansas on the Orphan Train in 1906, their separation, and Oliver's final emancipation from foster care. It was written for the sake of her family, Aviles says. She wanted to have a record to pass on about the little-known experiences of the orphan train riders, and her grandfather in particular. She presented the book to her father, Oliver's youngest son, on his 75th birthday. She hadn't planned a second book, but children who read the fist one kept asking what happened to Oliver, and if he ever saw his brother again. The second book, Beyond The Orphan Train, begins with Oliver at age 15 when he ran away from his foster home. He worked hard and saved his money to search for his brother, whom he eventually discovered back East in a new foster home. "By the end of the second book, kids think Oliver is a hero," she says. Much of the material for the latest book, Peanut Butter For Cupcakes, came from oral history provided by her father, Ben Nordmark, now 79, and his brother, Jim, 82. She decided to write it after her uncles kept asking, "When are you going to write our story?" The new story tells of Oliver losing his young wife and trying to raise six small children during the Depression. While there was a great deal of hardship throughout Oliver's life, he lived by the pholosophy, "nothing ventured, nothing gained," a saying Aviles says he used to admonish his own children and grandchildren throughout the years. Despite the difficulties he experienced, Oliver was determined to make the best of his circumstances and used every opportunity to the fullest. Aviles says of her remarkable grandfather, who lived to be the age of 95, "He was getting a lot out of life." She believes that the greatest lesson to be learned from Oliver is this: "In the end, it's what you do with what you have. Your life is your own. It's what you make of what you're given." Aviles' second goal in writing the books was to educate children. Avile says she likes to tell true stories that inform people, especially children, about the social history of how real people lived during a period, rather than textbookish commentary. She believes this is a way to spark an interest in children for history. She enjoys doing school programs and is inspired by her young students' enthusiasm and curiosity. The final goal for the books is to help get the word out about the Orphan Train Museum. Oliver and his brother Edward were a part of a little known period of history called the "Orphan Train Movement." From 1854 to 1929 - a period now widely recognized as the beginning of the American foster care system - an estimated 200,000 orphaned or abandoned children were sent from primarily NYC and Boston to other parts of the country. Some children found loving adoptive homes; others were abused and used only for work. The National Orphan Train Museum officially opened on 9-15-07, in Concordia Kansas, to register and tell the stories of the orphan train riders, many of whom were surprised to learn that there were trains other than their own, due to the secrecy of the times.